The rollout of NVIDIA’s RTX features in gaming has lagged up to this point, thanks in large part to the fact that the DXR-supporting Windows 10 1809 build was pulled by Microsoft right after it released. That build was finally reinstated two days ago, so it sure didn’t take long for NVIDIA and its partners to coordinate some quick releases. As of today, Battlefield V can take advantage of DXR’s ray tracing capabilities, while the Final Fantasy XV standalone benchmark gets DLSS (deep-learning super-sampling) anti-aliasing added in. That benchmark isn’t worthwhile as a benchmark due to poor optimization, but it’s still suitable as a tech demo. The benchmark is going to be released at 5PM PST today, while BF V‘s DXR augmentation patch is now available. techPowerUp wasted no time testing DXR out, and some of its findings are interesting – but not too surprising. Word on the street has said that using ray tracing will dramatically impact performance, and that’s absolutely the case. At 1440p, techPowerUp found the RTX 2080 Ti could deliver about 50 FPS when the highest DXR setting was used. Just like AA and AF, DXR has multiple levels of intensity, although the top three don’t seem to impact performance any differently. At 4K, the same GPU dropped to 30 FPS (from 83 FPS with DXR off), and at 1080p, 65 FPS was delivered (vs. 159 FPS). In a post on the NVIDIA website, the company gives suggestions about which hardware to use for which settings configuration. RTX 1070 users are relegated to using the Low setting at 1080p, while the 2080 boosts that to Medium. The 2080 Ti of course becomes the flagship option for DXR, allowing 1080p/Ultra or 1440p/Medium. It’s unfortunate that the performance hit is so great, but it’s not unsurprising given what NVIDIA is trying to pull off here. Ray tracing isn’t some menial process. The fact this exists today still impresses me. So, the fact that first-gen is as playable as it is, is fine for me, because I know it’ll get better as time goes on. The biggest beef I have is with the cost of the GPUs, because I assume RTX is the reason for the price hike. With DXR Low, we might as well rule out the 2070, because no one ever considers low to be an acceptable setting. That means a $699 RTX 2080 is needed for 1080p gaming with DXR – in an age when NVIDIA is pushing 4K/120Hz~144Hz monitors. It should be stressed that Turing’s performance in general is fantastic, and market-leading. It’s only with DXR content when a performance hit like this is going to be endured, and as unfortunate as it is, that’s the price to pay for such bleeding-edge, forward-thinking tech. You’re making a mistake if you liken this to PhysX. Destructible environments are fun (and are possible without PhysX), but lighting can be crucial to a game’s atmosphere. I installed Battlefield V not long ago, and plan to drop an RTX 2080 Ti in my main rig to experience the ray tracing feature in all its glory tonight. I’ll post some thoughts tomorrow. 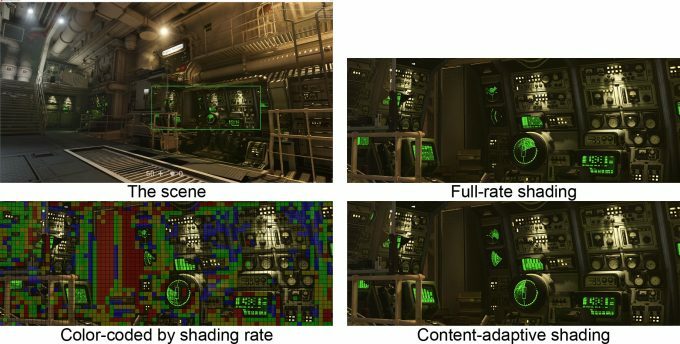 As for Wolfenstein, it will gain the ability to use Content Adaptive Shading (CAS), which lowers the shading rate in areas of a scene where less detail is not going to be noticed, notably with areas that do not change at all from frame to frame. This addition means that RTX features have been released to three different APIs in a single week: DirectX 11 (FFXV Benchmark), DirectX 12 (Battlefield V), and Vulkan (Wolfenstein II: The New Colossus). Let’s hope DLSS makes it to the actual FFXV soon.